Since the Duchess of Cambridge married into the Windsor family in 2011, we've seen three tiaras -- the Cartier Halo, the Lotus Flower, and the Lover's Knot -- reappear for the first time in decades. But there are still pieces from the main line of the family lurking in the royal vaults, many of which haven't been worn in public for years. Here's a look at several tiaras that we haven't seen the British royal ladies wear in more than a decade. This diamond, silver, and gold tiara was worn regularly by the Queen Mother in the early years of her marriage, but after she became queen consort, it was largely relegated to the back of her jewelry box. It hasn't been worn in public in over half a century, and it has never been worn publicly by anyone other than the Queen Mum. When she died in 2002, the tiara was inherited by Queen Elizabeth II. We know it's still in the vaults and still wearable, because it was photographed in 2012 for Hugh Roberts's landmark royal jewel book, The Queen's Diamonds. This turquoise and diamond tiara belonged to Queen Mary and the Queen Mother before ending up in the collection of the late Princess Margaret, who became its most frequent wearer. 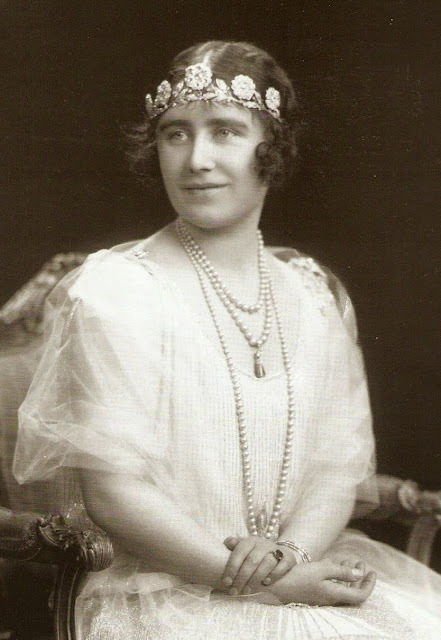 She alternated the turquoises with her beloved Poltimore Tiara throughout her life; my records note that she wore the tiara regularly until at least 1990. It was included in 2002 for Geoffrey Munn's major tiara book, which I believe is the most recent time the piece was photographed. 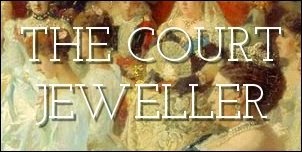 As the tiara was not sold in the 2006 auction of Margaret's jewels, many assumed the turquoise set was still with one of her children. However, with the resurfacing of the Lotus Flower Tiara (also from Margaret's collection) on the Duchess of Cambridge, I'm increasingly of the belief that the turquoises were returned to the palace along with the Lotus Flower Tiara after Margaret's death. Here's hoping that's the case and we'll see this one make a reappearance soon. This hidden tiaras is one of my favorites: the modern diamond and sapphire bandeau that belonged to Queen Mary. The tiara has long been said to have been made in Russia; some have even attributed it to the collection of Empress Marie Feodorovna, although I don't think that has ever firmly been established to be true. Queen Mary wore the tiara in a few portraits, and after her death, Princess Margaret was photographed in the piece on at least four occasions: during a tour of the West Indies in the spring of 1958, during the West German state visit in October 1958, at a state banquet at Buckingham Palace in April 1960, and at the wedding of Princess Astrid of Norway in January 1961. Astrid's wedding was, I believe, the last time the tiara was seen in public or photographed. (Please correct me if I'm wrong about that!) I am very, very hopeful that this one is still in the palace vaults and that Kate resurrects it soon. This tiara arrived in the British royal vaults by way of Queen Mary's mother, Princess Mary Adelaide, Duchess of Teck. Unlike some of the other "hidden" tiaras on this list, we know exactly where the crescent tiara is today: in the jewelry box of the Duchess of Cornwall. It's one of the three tiaras that Camilla was given as a long-term loan from her mother-in-law, Queen Elizabeth II, in 2005. But Camilla still hasn't worn it in public -- in fact, I don't believe that anyone has since way back in 1939. It was, however, photographed in 2012 for The Queen's Diamonds. 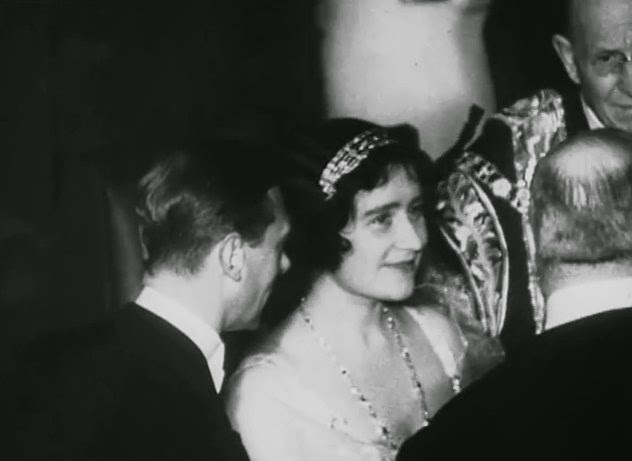 This petite tiara, which belonged to the Queen Mother, is made by setting three of her five Cartier diamond-and-gemstone bracelets on a bandeau frame. She didn't wear it much during her lifetime, and I don't believe any other royal lady has worn it in bandeau form. We know, however, that the bracelets eventually ended up in the collection of Queen Elizabeth II. All five of them were photographed in Dressing the Queen, Angela Kelly's 2012 book. I think we can presume that the bandeau frame is probably also still in the royal vaults, so it's possible we could see this tiara reappear in public in the future. It's been almost eleven years since we've seen the Queen wear this diamond and ruby circlet, which was made in 1853 for Queen Victoria. Although it is an heirloom of the crown, and therefore should have passed to the Queen when she ascended to the throne in 1952, it stayed with the Queen Mother until her death in 2002. The Queen has only worn the tiara in public once to date: during a state dinner in Malta in November 2005. We've seen the Queen wear the accompanying crown ruby set in recent years, so here's hoping that she'll break out the circlet again soon, too. 2005 also marked the last public wearing of this heirloom royal tiara, which was constructed for Queen Mary in 1911. The sparkler is another of the pieces given as a long-term loan to the Duchess of Cornwall, who wore it during the Norwegian state visit in October 2005. It's been locked away since then, although it was photographed in 2012 for The Queen's Diamonds. This one's a serious headscratcher, and it may not be in royal hands anymore at all. Queen Mary's tiara collection was so extensive that it included two rather simple diamond bandeaux: one that was bequeathed to the Kent family, and this one, which features diamonds set in lozenge patterns. Mary wore the bandeau with pear-shaped pearl toppers. She loaned the tiara, sans pearls, to Princess Margaret, who wore it in 1948 during the inauguration festivities for Queen Juliana of the Netherlands. I don't think this one has been seen at all in public since Mary's death in 1953, and it may not exist at all now -- or it could still be buried away in the vaults at Buckingham Palace. Here's a tiara that is definitely in the Royal Collection, but which will likely never been worn by a royal again. 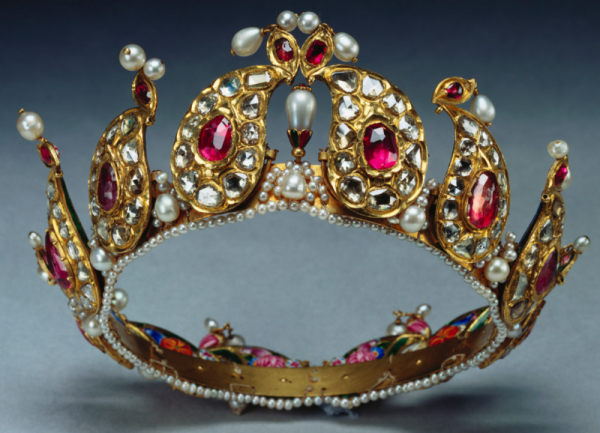 The piece, which features rubies, pearls, and "lasques" (thinly shaved slivers of diamonds), was "presented" to Queen Victoria during her reign. The unusual diadem also features enameled portraits on the inside of the tiara. Victoria left the piece to her daughter-in-law, the Duchess of Albany, but by 1924, it was back with the main line of the Windsor family. That year, King George V placed it in the crown's Indian Collection, and it's still there today.